Caroline Clarke is our project lead in the Diocese of Rochester. 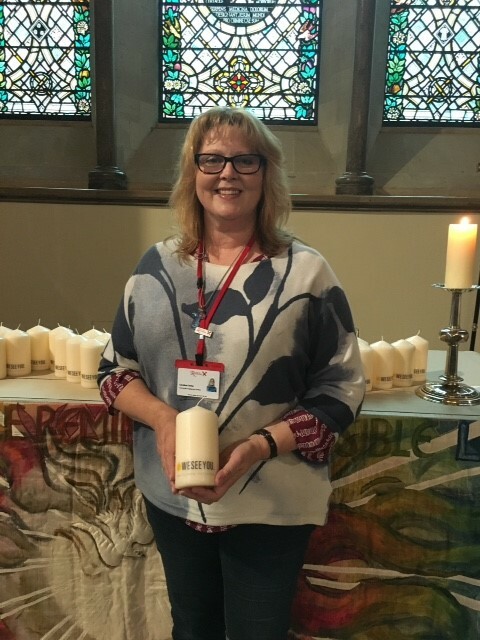 As well as living almost her whole life in the diocese, for the last five years she has been the Community Engagement and Social Responsibility Adviser. We spoke about what motivates her and the exciting event she has planned to raise awareness of modern slavery in Kent and the London boroughs of Bromley and Bexley. Hi Caroline! That’s a long job title you’ve got there, can you tell us what it means? I always have to explain what it actually means! It’s includes all the work around Fair Finance, so supporting people who are in debt, helping people learn how to budget, or getting people back into work via CAP Job Clubs. We also have several Homeless projects, Community Cafes, work with ex-offenders, those with mental health challenges, etc: anything which supports our communities to flourish. We’re also campaigning to end modern slavery and to Stop Loan Sharks. We work very closely with partners, like local authorities and the police, and charities and agencies. Ultimately what we’re interested in is whole person care in our community: Word in Action. What kinds of modern slavery are there going on in the Diocese of Rochester? We’ve heard stories of gangmasters hanging around outside our winter night shelters, outside our food banks, trying to recruit people into what they think is a job, when it is actually joining a gangmasters’ slaves. We’ve had reports about slavery in car washes, in nail bars and on farms. I remember when car washes started springing up all over the place, we all just assumed that the ever lower prices they were charging was because they were trying to get our trade, like a price war, but now we realise that it’s because some of these car washes aren’t paying the people who are washing the car, that in fact they’re slaves being controlled by a gangmaster. How are you raising more awareness in the diocese? We are currently running a campaign for Hope 2018 called Setting the Captives Free. It’s about freedom; from slavery, addictions, domestic violence, and debt. For the part about slavery we have had training from the Gangmasters & Labour Abuse Authority. From that a growing number of churches now want to be places where the emergency services can take victims that they rescue during a raid. One person has so far gone on to be a volunteer driver, taking victims to a place of safety. What else is going to be going on? We’re running an amazing conference on Saturday 16th June, we’ve got top class speakers coming, and I really want to invite anybody, not just people from the Church of England, but people from any denomination, people who run agencies, people from the council, members of the public, because if you come to that conference you will hear all about what exactly this term modern slavery means and how you can play your part in making a difference. We’ll have Police Inspector Gary Byfield from the Bromley Borough Operations Command Unit from the Met Police, we’ll have Lara Bundock from the Snowdrop Project in Sheffield, they support victims of modern slavery. We’ll also have Bishop Alastair Redfern, who is the Bishop of Derby, he campaigned in the House of Lords and across his own diocese to raise awareness of modern slavery. We’re hopeful that all the people who come will then go back to their community and share that knowledge. We’re also hoping to be able to make a list of churches who are available to support victims, a list of people to be drivers, and possibly even to engage in some hands on victim support ourselves, working with probably the local authority and other agencies as well, we’re really excited about it! What do you think people can practically do to help end modern slavery? The first thing to do is book your free place at our conference! Make sure you’re coming because it will cover everything you need to know from all angles. From that you will be aware of what the signs are to look out for: the next time you use a carwash or nail bar, or have people in to work on your drive, or notice a van full of people in your neighbourhood, you will be asking yourself the question could these people be slaves, and working your way through the slavery checklist. We all believe, and this is something The Clewer Initiative has stated, that the tools to end modern slavery exist in our community. There are churches in all our towns, our cities, our villages. If we can raise awareness of modern slavery in all those communities, then we can surely make a huge difference. Together we can end this evil crime against humanity. As Christians we are called to love our neighbour, whoever they are. For me personally it’s not just about knowing it but about doing it, it’s about putting Word into Action and helping others to do the same. I can’t stand injustice and many people across this country can’t stand injustice either. Taking away a person’s freedom and making them a slave isn’t just an injustice, it is a crime against humanity. So I will do all I can to help our diocese and the communities within it to be part of ending modern slavery. Favourite meal? Roast dinner: actually if money was no object, my dream meal is scallops or mussels with frites! The one thing you can’t live without? Chocolate: milk chocolate. Coffee or tea? Decaf tea. What did you want to be when you grew up? I wanted to teach tap dancing and own my own tap dancing school. I did do both actually! Dream holiday destination? I love to see nature and really big landscapes, so somewhere like Alaska or Greenland, before the ice cap melts. Get yourself booked on to the Conference in Beckenham on Saturday 16th June here. are you WORKING TO end modern slavery? Allows us to know which region/diocese you are from without revealing your full address. Thank you for sharing your story with us, one of our team will be in touch with you. Allows us to provide you with local news from the initiative without revealing your full address.